. 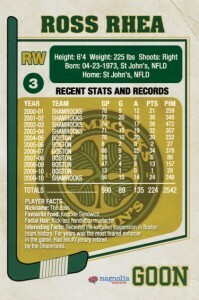 Emilo Estevez and his Mighty Ducks may have had an NHL team named after them, but that was all about corporate synergy. 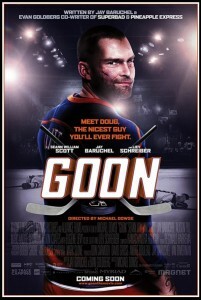 But now Magnolia Pictures has Goon entering the mix of Hollywood hockey. 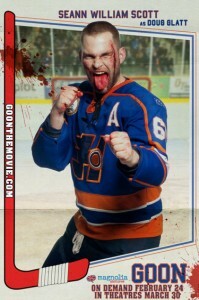 Starring Seann William Scott, Jay Baruchel, Liev Schreiber and Alison Pill, the comedy follows a Boston bouncer as he tries to make it in minor league hockey as a thug. Currently available on-demand in the United States and in theaters in Canada, it will expand to American theaters on March 30. 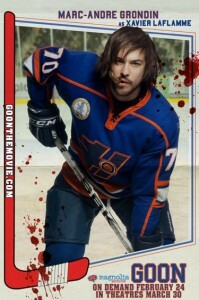 The film is receiving solid praise, currently sitting at a 73% approval rating on Rotten Tomatoes. 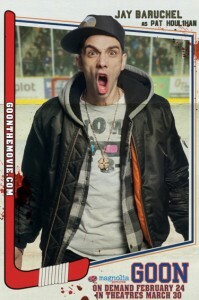 Magnolia Pictures has provided the Cardboard Connection with a downloadable set of Goon trading cards. Enjoy! 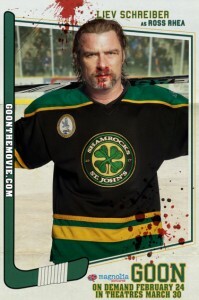 Of the movie's main cast, only Schreiber has a connection to trading cards. He had an autograph in Rittenhouse's X-Men Origins: Wolverine. One of the top cards in the set, it usually sells for $35-50. 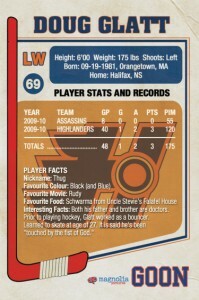 Sticking more to the traditional hobby, collectors can find plenty of tough guys in 2011-12 In the Game Enforcers.